Quick take: The Baby Lit Series is an honorable concept, but with spotty execution. When I first saw this series, my English-teacher heart did an excited little skip. 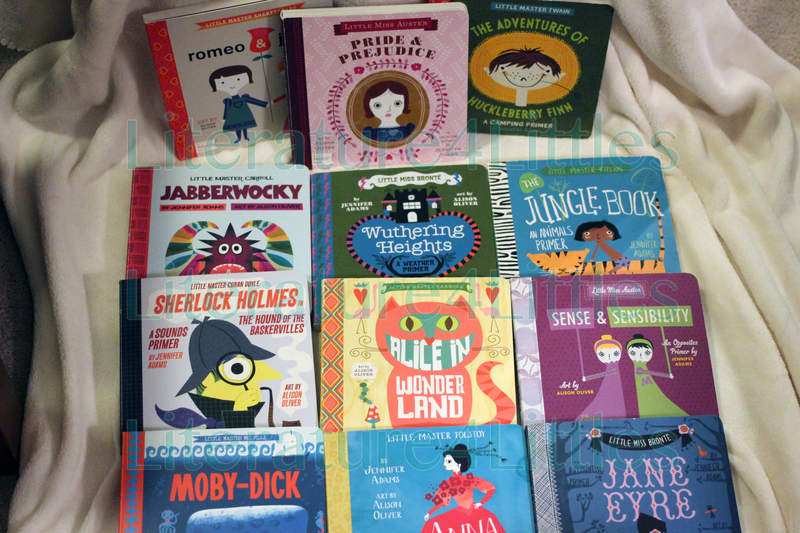 Classic novel elements integrated into baby books? I’ll take one of each! 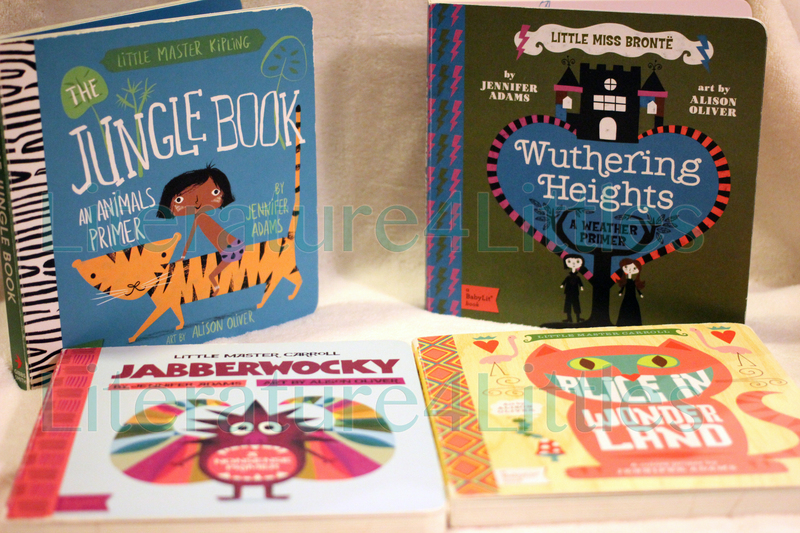 BabyLit touts its books as “fashionable way to introduce your toddler to the world of classic literature.” To be clear, these are primer books – very, very simple, with one or two words/concepts on each page along with a corresponding illustration. 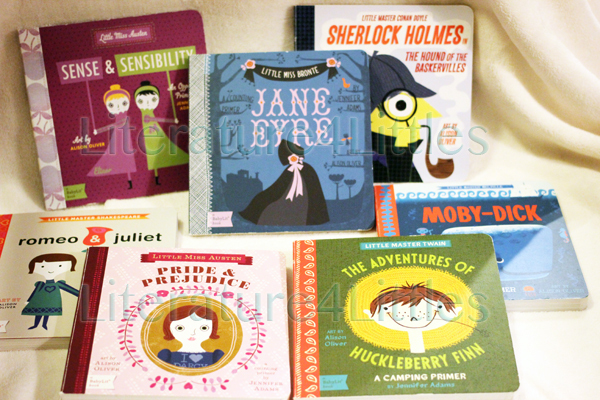 In general, the books themselves are typical board books, constructed from thick paperboard with a semi-glossy finish. They’re pretty sturdy, but after a few months of almost daily use they’re showing signs of wear, especially on the edges and corners. Alison Oliver, illustrator of the books, uses soft, simple shapes to draw the concepts. The books rarely have harsh lines, and use color generously. Some of the illustrations have good contrast, which is important to help distinguish the concepts the books are meant to introduce. I did take issue with illustrations in a few books, but I’ll get to that later. As a reader and a teacher, I adore some of the classics and I dislike others, but will acknowledge that the classics are, well, classics for a reason. With that said, I was expecting the Baby Lit books to effectively tie together primer concepts (counting, opposites, animals, etc) with elements or details from the novels that inspired them. Seriously, if you’re going to take on the classics, do them justice. 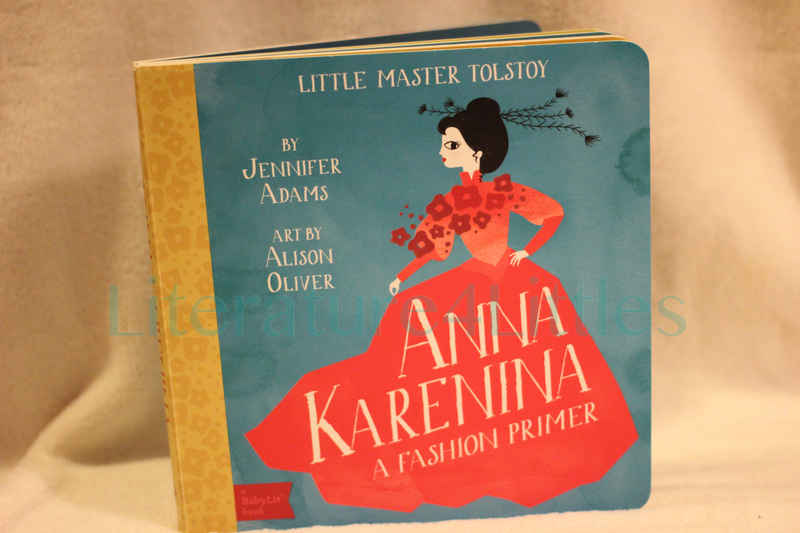 One book in this series that I really took issue with is Anna Karenina. Subtitled “A Fashion Primer,” that was my first hint that this book was going to be a disappointment. I get that Anna Karenina is centered on a socialite, but really?! Each page in the book is filled with illustrations (beautiful ones, I might add) of women’s fashion-related items, such as earrings and hats. The book merely states the name the illustrated clothing item or accessory on each page, and uses five lines from the actual novel. This sounds okay… until you realize the named articles of clothing were sometimes miniscule (Hairpins? Buttons? Earring?) and/or were hard to see. Don’t write off this series completely though. Honestly, that was the ONE book in this collection that I really disliked. Some of them show much more promise than others. The Jungle Book, An Animals Primer – Introduces major animals in the novel by naming them. Each animal includes a line from the novel connected to that character/animal. Jabberwocky, A Nonsense Primer – This takes Lewis Carroll’s original Jabberwocky poem and breaks it up line by line for each page. It makes a fun, silly read (most of the words are nonsense). The Baby Lit version does edit out a few lines and stanzas to avoid some of the more violent scenes (no vorpal sword or Jabberwocky-slaying here), so it’s definitely kid friendly. Alice in Wonderland, A Colors Primer – This one takes the quirky characters from Lewis Carroll’s adventure novel and uses them to introduce color. The White Rabbit, Caterpillar, Queen of Hearts, and Cheshire Cat all make an appearance in this book, along with other elements from the novel. Wuthering Heights, A Weather Primer – Great illustrations and appropriate quotes from the actual novel go along with the weather-related terms introduced in this book. In general, the Baby Lit series has potential, and the better ones would make a great addition to your baby/toddler’s library. I would recommend these for 0-3 year olds.